All applicants to the posts of Junior Assistant (Directorate & District) in the Forest Department in response to the office recruitment advertisement dated 20th Dec, 2016 are informed that a written recruitment test will be conducted in all the districts of Assam on Sunday the 9th July, 2017. 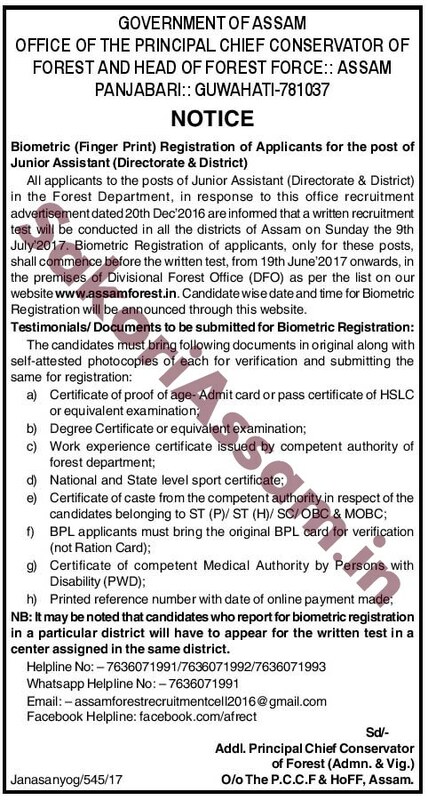 Biometric Registration of applicants, only for those posts shall commence before the written test, from 19th June, 2017 onwards, in the premises of Divisional Forest Office (DFO) as per the list on the official website www.assamforest.in. Candidate wise date and time of Biometric Registration will be announced through that website. The candidates must bring following documents in original along with self-attested photocopies of each for verification and submitting the same for registration. a) Certificate of proof of age-Admit cards or pass certificate of HSLC or equivalent examination. b) Degree Certificate or equivalent examination. c) Work experience certificate issued by competent authority of forest department. d) National and State level sport certificate. e) Certificate of caste from the competent authority in respect of the candidates belonging to ST(P)/ ST(H)/ SC/ OBC & MOBC. f) BPL applicants must bring the original BPL card for verification (not Ration Card). g) Certificate of competent Medical Authority by Persons with Disability (PWD). h) Printed reference number with date of online payment made. It may be noted that candidates who report for biometric registration in a particular district will have to appear for the written test in a centre assigned in the same district. For more details you can download the official notification from below. I got my application verified and accepted but payment status is showing rejected. Why? Will I be able to take the exam?